As the twenty-first century sails through its second decade, we can no doubt all agree that the social and environmental landscape has changed throughout the world in every sphere of life. Across the planet a shift in consciousness has taken place, and people are looking for role models in areas they were never before exposed to or informed of. And in particular, their attention is drawn to traditional, sustainable communities as examples of social and environmental consciousness. From their previous role as unknown communities living on the outskirts of the world, tribes are now being looked to by millions across the globe as examples of how to live on the earth without inflicting oneself upon her; how to honour the earth while taking one’s daily needs from her; how to give back to her instead of abusing her. Yet at the same time, when we look towards tribal communities, we cannot help but notice how they are often in decline due to modern ways creeping in and undermining their traditional values, education, and social systems. It was with this in mind that I began to meditate on reaching out to the tribal people of India. I felt inspired by the Lord to pursue this, and when I spoke to my spiritual master, His Holiness Jayapataka Swami, he gave so much priority to discussing it with me for many hours that I felt highly encouraged. Then two years ago, Sridama Govinda Dasa (who is now Chief Co-ordinator) came forward spontaneously to help, and thus we established the ISKCON Tribal Care Initiative to provide educational, emotional, social, spiritual, and healthcare to tribes throughout India. This is not a philanthropic endeavour to support, encourage, and assist tribal communities, but rather an opportunity to draw from centuries of wisdom and develop a higher consciousness towards the needs of others, and to help them reestablish their own solid foundations, to not let them disappear in the modern culture. And so the ISKCON Tribal Care Initiative is an investment in the future that benefits both us and those we reach out to. In terms of spiritual care, ITC has placed Bhagavad-gita's and small altars in tribal communities, built prayer halls, and published Krishna conscious books in tribal languages. In educational care, wehave set up primary schools, provided scholarships and study materials, and sponsored students for higher education at Vrindavan Gurukula. And in health care wehave established health camps and first aid centres. We promote tribal cultural programs among international audiences during Mayapur’s Gaura-purnima festival, hold major tribal festivals with mass prasada distribution, and have helped tribal people in establishing and developing cottage industries. Earlier this year ITC hosted a convention in Mayapur, which saw twenty-seven tribes from across Assam, West Bengal, Jarakhand, Odisha, Nagaland, Mizoram, Meghalaya, Bihar, and Tripuri represented. The convention was based on the trilogy of go (cow), Ganga, and Gita. Tribal people live in the mountains and upon the banks of rivers in a natural way, these things are the foundation of their lives. It is befitting, then, that the theme of the celebration was the worship of cows and the Ganga. The tribal peoples’ way of life is very well suited to Krishna consciousness. Whenever I visit tribal communities they receive me with flowers that they have collected from the forest, which is the centre of their livelihood and provides their needs. They simply live off the forest, and they have loving relationships amongst themselves and with the members of their community. They are much happier than the people who live in the cities. His Excellency Mr. Padmanabha Balakrishna Acharya (the Governor of Assam, Nagaland, Tripura) was the chief guest of the convention held in Mayapur. Mr. Balakrishna Acharya played an instrumental role by assisting Srila Prabhupada in the early days of the movement. Also present were Mr. Sudarshan Bhagat (Minister of State for Rural Development, Govt. of India), Mr. Ujjala Viswasa (State Minister for Technical Education, Govt. of West Bengal), Col. Deoshehe Y. Sema (Ex. Minister of Nagaland), Mr. Singha Roy (Sikhya-ratna) and Mr. Vikash Bhatacharya (Additional Public Prosecutor). During the Convention, Jayapataka Swami spoke of how the tribal people are very dear to Krishna . In Vrndavana-lila, the tribal people would take the dust of Krishna ’s lotus feet and put it all over their bodies. And in Puri, Lord Jagannatha, as Nila Madhava, would accept the offering of a tribal (sabar) King Biswabasu. In this way we areremindedthat by serving tribal people, we satisfy Lord Krishna . 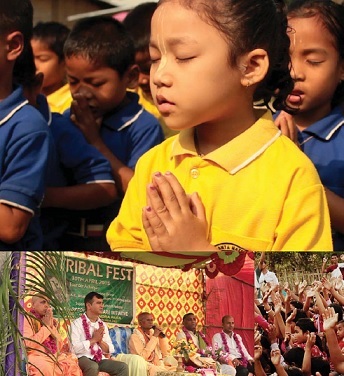 The tribal people responded to this convention with admiration and gratitude for the work that ISKCON Tribal Care is doing, saying that although the government had made attempts through its outreach programs to assist them, still there was nothing like the genuine approach of ISKCON devotees. But we could only progress as much as we have with our work over these past two years because of the eagerness and enthusiasm shown by the tribal people. They are naturally very simple people, which is one of the main components for developing God consciousness. In December last year around twenty-five devotees from India, Russia, USA, Australia, Kazakhstan, Ukraine, and Brazil visited tribal areas in dense forest and mountain country in remote parts of the country, journeying into interiors that are otherwise untouched. In one place, the locals built a bridge to allow the devotees to enter. There, ITC built a school, the Ananda Bazaar, for the tribal children. In the 1940s, missionaries visited these areas, converted the locals, and built schools for the children. Unfortunately this has seen a decline in the cultural and traditional teachings and education in the area, a decline that is indeed a loss across every social arena. I met with teachers and parents, and explained the unique contribution of Ananda Bazaar in reestablishing the cultural heritage of the area. The goal of the school is not only to teach the children how to be a big professional engineer or doctor, but also how to understand the highest goal of life, and the eternal identity of the soul from the very beginning life. These are teachings that are naturally inherent in the upbringing of tribal children unless they are redirected by alternative education systems like that left by the missionaries, which was considered “higher” by them. On the other side of the river, we built a small temple in the middle of the forest. Local leaders showed their appreciation to devotees for coming to their remote villages and extending their loving care by arranging gatherings attended by hundreds, sometimes thousands, of local villagers. In the cities devotees have held public programs to bring attention to the needs of tribals: programs attended by Governors and state officials. In Haflong, about eight hours’ drive from Gauhati, ISKCON Tribal Carewas welcomed by the Dimasar tribe, one of whom is the Chief Executive Ministerof Haflong Autonomous Council—and an ISKCON Life Patron—Mr.Debojit Thaosen, who praised ISKCON’s efforts and declared that if land is needed to develop ITC’s activities then the city municipality is ready to give. So we are getting a lot of success, because the response to ITCI has been overwhelming, and we have been received with open arms and loving hearts. That Caitanya Mahaprabhu wanted the holy name to be heard in every town and village is something ITCI carries as its mission statement. But it is more than just distributing books or building temples: it is also a matter of caring for the praticalneeds of individuals and groups. Mahaprabhu distributed love of God to one and all. It is our duty, therefore, to extend love and care to one and all, in a spiritual and a practical sense. Every living entity needs this, irrespective of social or cultural backgrounds.In ISKCON we have established so successfully our Devotee Care programs, and in the same way ISKCON Tribal Care Initiative is designed to cater to a wide area of needs for tribal people. We are inspired by the achievements of the past year, encouraged by the response of the people we are reaching out to, and we pray for the continued support of people worldwide to broaden this initiative across India. Hare Krishna .